Here at Hands Cleaners, we are experts in providing commercial window cleaning in Leicester and across Leicestershire. Our commercial window cleaners pick the perfect solution for your business building and can work around any schedule that works for your company. If you are a small business, located in the East Midlands looking for a window cleaner, then Hands Cleaners can help with our traditional method. The traditional way of window cleaning has been around for years, and it is still as effective now as it was back in the day. With a simple ladder and bucket system, we can get up close to each window going into detail, getting into each tiny corner making sure your windows are spotless. We pride ourselves on being one of the most professional and safety-conscious cleaning companies in Leicester and the Midlands. With a squeegee and window leather in hand; we still guarantee a top quality job! 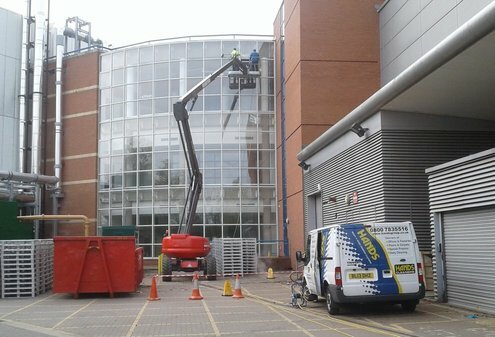 As the leading commercial windows cleaners in Leicester, no job is too big for us. When looking for high-level abseil window cleaning, look no further than Hands Cleaners. We pride ourselves on being one of the most professional and safety-conscious window cleaning organisations in the Midlands. Our specialist cleaning teams are capable of safely tackling almost any window cleaning challenge! The pole-fed, ‘Reach and Wash’ pure water system now provides the safest and most cost-effective method of washing windows and frames. Reach & Wash has now been accepted as the most sensible way of work. Without the need for ladders, scaffolding and chemicals, risks are considerably reduced. Our reach and wash systems use only de-ionised water, and there is no need for cleaning detergents or secret ingredients just pure, clean water. Not only is it better for buildings but kinder to the environment and as it is de-ionised water, it will simply evaporate away leaving no nasty water marks or stains. Regular cleaning with pure water results in sparkling windows which stay cleaner for longer. Our High Level/ truck mounted Window Washing is perfect for large commercial properties as we can reach the top of tall buildings. The platform can move up and down to reach all levels. Here at Hands Cleaners, we provide high-quality window cleaning inside buildings as well as outside. We believe in finishing the job off correctly so if you need commercial indoor window cleaning, we can help. We understand that your business needs to look clean and tidy and the same goes for your windows. Hands Cleaners we like to listen to your commercial needs and find the perfect solution for you and your business. We do not include any long-term contracts and no hidden extras. What we do provide is flexible relief teams; give you free advice and your very own dedicated manager. Our specialist cleaning teams are capable of safely tackling almost any window cleaning challenge. For your peace of mind read our better cleaning guarantee. We don’t only do commercial window cleaning in Leicester, Derby and Nottingham but we also offer a range of different cleaning services such as office cleaning and floor cleaning. Bespoke Window Cleaning Solutions – With each business, we work with there are different types of buildings to clean, which is why we provide bespoke window cleaning. With the easy to reach windows the simplest solutions are the best, however, we also have solutions for the hard to reach places with our high-level platforms or abseiling. No job is too big or too small for us to tackle. Experience – We have over 40 years’ experience in window cleaning and have an in-depth understanding of the best way to treat different styles of windows. You are guaranteed the best results each time. Comprehensive Window Cleaning – We offer comprehensive window cleaning services which include inside window cleaning. We ensure there are no streak marks or watermarks left on each window. No marks will be missed and our high-level of service will be delivered to all clients. For Commercial Window Cleaning in Leicester, contact us today to get a free quote on 01509 501 110.